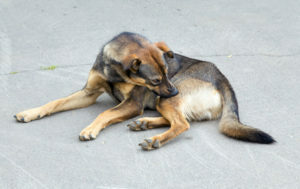 Unfortunately, this itch and scratch cycle causes your pet’s skin to become even more inflamed and tender to the touch. Your pet will eventually experience hair loss, scabbing, and open sores on the skin if his allergies are not treated. There are many steps you can take at home to fight your pet’s allergies. First, give your pet weekly baths with a grain-free shampoo. This helps to wash away allergens on the coat and skin. Baths are best for dogs who are outside each day and accumulate allergens on their fur and paws. It’s important not to over-bathe your dog and cause dry skin, so try supplementing full baths with foot soaks. Soak your dog’s paws each time he returns inside. This will reduce the amount of allergens being tracked into your house and spread through the indoor environment. Other at-home preventative steps include carefully vacuuming and cleaning the places in your home where your pet spends the most time, using an anti-inflammatory diet that is low in grain content, and adding omega-3 fatty acids into your pet’s diet to decrease inflammation. Now that your pet feels more comfortable, it’s time for you to get relief from your own allergy symptoms. Call (813) 670-7062 to make an appointment at Kratz Allergy & Asthma in Odessa or Port Richey, Florida. Dr. Kratz specializes in adult and pediatric allergy and immunology, so he can resolve your worst allergy problems and help you enjoy autumn again.